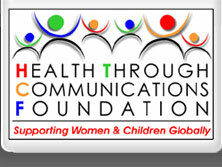 The goal of the Health Through Communications Foundation is to offer culturally sensitive music programs for minority children to prepare them for a creative and cooperative future with a high self-esteem, and a capacity for peace building by drawing upon their innate creativity and imagination. We believe that a child’s natural or even learned cognitive processes can influence development for the better, both in the short and long term. We also believe that positive, early experiences shape a young child’s personality in ways that remain stable throughout much of their life. Studies have shown that a child’s psychological growth and school performance can be enhanced by a focus on their artistic talent. Children who participate in music and arts programs are more likely to do better than those who do not. Troubled students engaged in arts and music programs have better attendance and increased cooperation with other students and teachers. When my friend Charlotte Jackson of San Diego heard about his plea, she referred me to the Note of Hope Foundation who gave us a generous grant of $500.00. Five old musical instruments where purchased all the way in the Dominican Republic. The people of La Vallee also sacrificed themselves to hire a music teacher and the children. Sometimes with empty stomachs they struggled to learn musical notes and play an instrument for the first time ever. 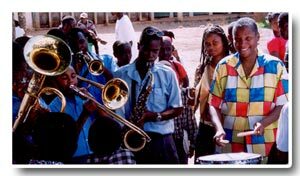 Six months later, in June of 2001, during the inauguration of the Parc Dr. Carolle Jean-Murat, the first public park purchased with the donations of caring friends here in the US, there was a school band ready to play the Haitian national anthem and entertain the crowd. The Clifford and Linda La Chappa as well as the people of the Barona Band of Kumeyaay Nation who are strong supporters of education programs for children heard about the story. They donated money to buy more musical instruments and help defray the cost to pay part of the salary of two musical teachers. 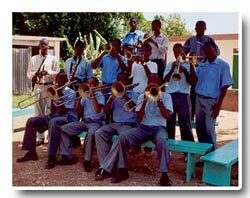 We now have a school band in Ridore, La Vallee de Jacmel that takes parts in all public celebrations. The children are actually learning basic musical notes and using recorders. The goal is that there are enough musical instruments available in the near future for everyone. We also hope to offer more music classes in the near future.